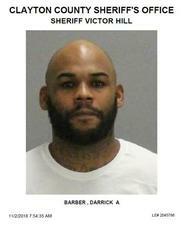 Darrick Antione Barber did not realize that he had picked the wrong county to hide out in until it was way to late. Yesterday, Barber found himself surrounded at a location in Riverdale by US Marshals and Sheriff Victor Hill’s elite Fugitive Squad. He choose wisely to surrender without a fight. Barber was wanted by the St. Louis Police Department in Missouri for Murders in the First Degree x 2. The charges stems from an incident which occurred on August 4th, 2018 when officers responded to a 9-1-1 call in reference to a shooting at a residence. Upon arrival, officers encountered a male victim outside the residence that had been shot multiple times who later died from his injuries. Additionally, officers located another female victim who had been shot and killed. Investigation into the double homicide led the St. Louis County Prosecutors Office to identify Darrick Anthony Barber as the perpetrator. Mr. Barber had been in a relationship with the female victim and after numerous domestic incidents, the victim had obtained a restraining order to protect herself from Barber. Barber is now waiting for extradition back to Missouri. Meanwhile, for his sin of choosing to hide in Clayton County, Barber will get plenty of practice facing the wall at Georgia’s toughest para-military jail now better known to all as the “Hill-ton”.